Yesterday we went on a glacier cruise inside Parque Nacional Los Glaciares in Argentina. We boarded a huge double-decker catamaran that left from Punta Bandera. 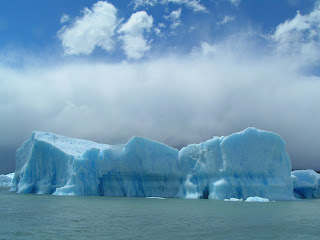 We sailed on Lago Argentino towards the mountain glaciers. 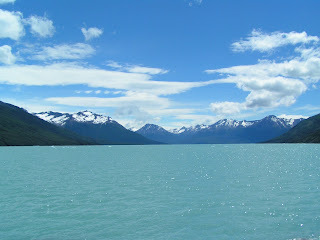 We went past Perrito Moreno, but didn´t see it because it wasn´t part of the tour. Not a big deal since we saw it anyway the day prior. The first glacier we came to was Spegazzini glacier (google earth this to get an idea) which was a branched glacier with three sources. It was really tall, taller than Perrito Moreno (so more than 60m high). The boat went really close and up and down a few times since it was a receeding glacier and apparently doesn´t break off and crash into the water very much. Next we went to Onelli Lake, which is an inland lake fed by something like 5 glaciers. We docked at Onelli Bay and walked thru a really cool forest until we reached Onelli Lake. We ate lunch on ´beach´ at Onelli lake, which was filled with icebergs, some huge and some mini, that came off the the glaciers feeding the lake. It was really nice. The water was really really cold. Some of the icebergs came to the shore, so we touched them and ate one. Yes, ate one. We ate an iceberg!!! Ahhhh!!! Well, not the whole thing, but part of it. After lunch we boarded the boat again and headed up toward Upsala glacier, which is just freaking huge. The day prior, or overnight, a large chunk (or nose, as they called it) broke off so we were sailing through monstorous sized icebergs, some as big or bigger than a house, and that is only what´s on the surface (15% is above water, the rest below). The captain of the boat was just zooming past them, but sometimes he stopped next to the really big ones so we could get a better look. These things were absolutely huge! Most of them were light blue or white because they had lots of air pockets in them, but the denser ones were a crazy bright and deep blue, like candy. As they melt, they change shape and reposition how they float in the water. We only came within a kilometer of Upsala because of the possibility of pieces breaking off and I guess smashing us. Still, the glacier is just huge. Tomorrow we go to El Chalten to begin our hiking around Mt. Fitz Roy. It is over 3000m tall and a granite spire. We will be hiking there for about 5 days, so we won´t be writing for a while. The computers here are all slow like poo, so we can´t upload that many pictures.